The socks feature an unusual placement of the arch increases – immediately next to the lace panel on each side. 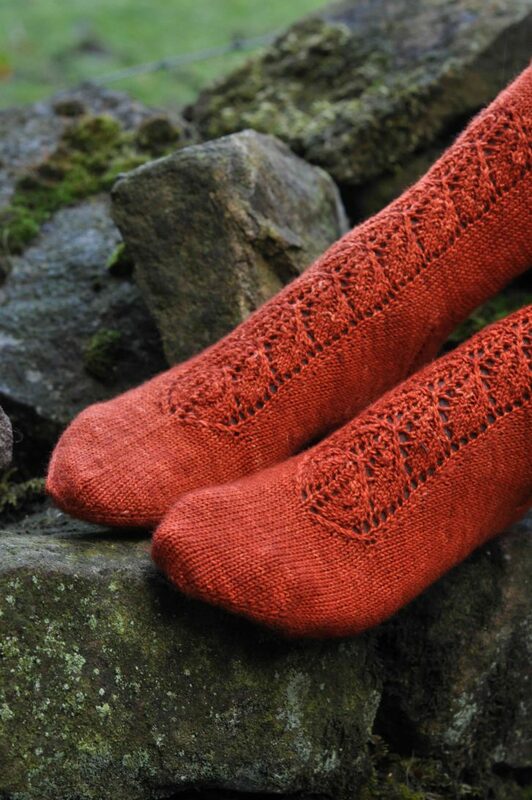 The pattern includes full instructions for the sock construction, and line-by-line instructions for the lace panel. The lace panel is also charted. You will need 300 – 350 metres (328 – 383 yards)of 4ply sock yarn. The pictured sample was knitted with ‘4ply High Twist BFL’ from The Knitting Goddess. Tension/gauge is 34 stitches and 48 rows per 4 inches in blocked stocking stitch/stockinette. Suggested needle size is 2.75mm/US 2, or size required to achieve gauge. 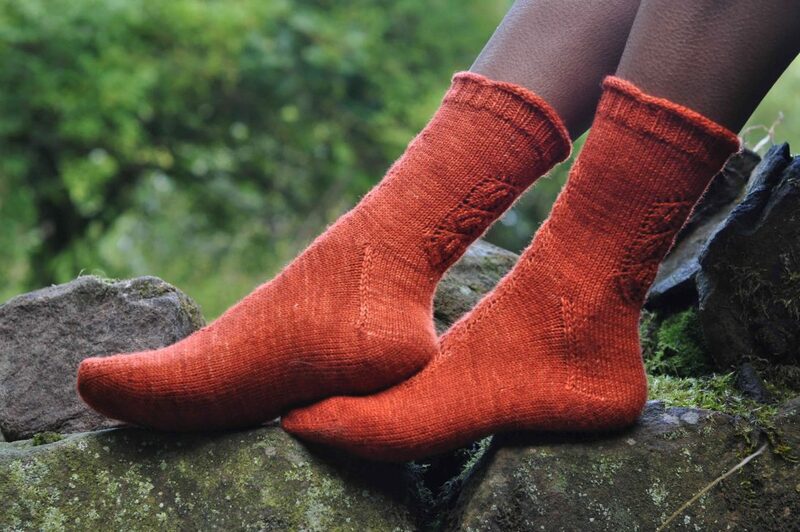 The pattern is also available in the ‘A Time To Knit’ collection (see ‘Books’) in which the pictured sample was knitted in ‘Rockhopper’ by Literally Yarn. I loved knitting this sample for Ann – the lace is so pretty, and keeps the knit interesting throughout. 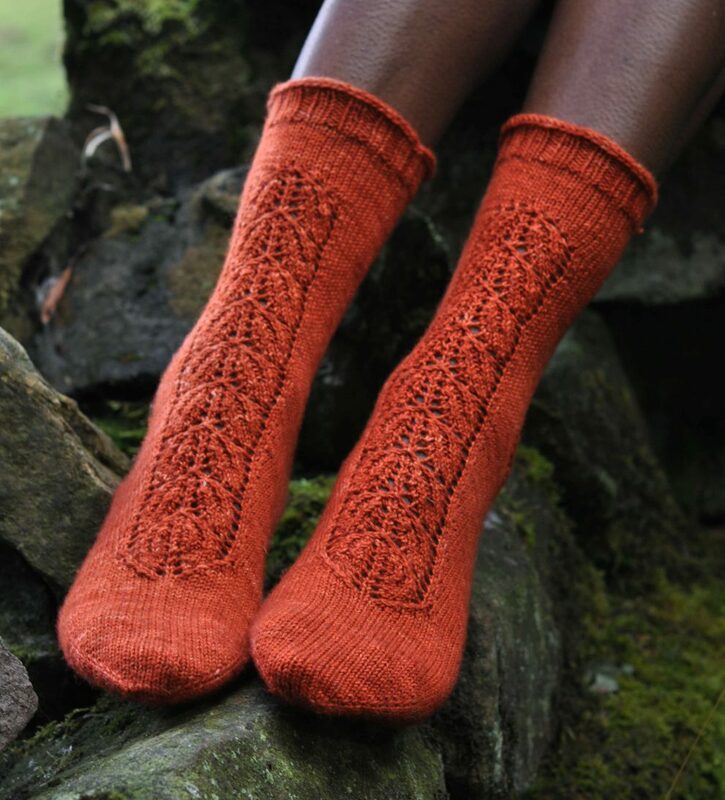 The pattern is clear and instructive – I particularly love the clever gusset, which makes the socks ideal for anyone with a high arch.